What's the maximum size SD card that the Picture Mate printer will take? Hi there, can you help, I'm looking for an electric lead for the Epson PictureMate printer. Do you know where I might be able to buy one? Many thanks, Judith. I have an Epson PictureMate and need a new photo cartridge. The one I have has a code of T557L. Can I still get this or is there another cartridge which is compatible to my PictureMate printer? I've not used it in seven years, please advise? Thank you. It's possible that T557L is the old Epson part number which has now been replaced by T557 which will do the same job in your printer. Where can I get the AC adapter for this printer? Unfortunately, we do not sell this type of accessory. Please contact the supplier of your Epson PictureMate printer for an adapter or contact Epson directly so they can advise you on where to buy this item. I have an Epson PictureMate and need a T557L colour cartridge. Please can you advise if these are still available or if there is an alternative cartridge? Please can you tell me if the Epson T557 photo pack will fit my Epson Picture Mate B271A printer? Will Epson T557 ink cartridges work in my printer? Yes, the Picture Mate B271A printer is the standard inkjet model and is the same printer we list under the name 'Picture Mate'. I need the T573 colour cartridge which I'm unable to find for my Epson Picture Mate printer. Can you advise please? Can you still purchase T557 cartridges for the Epson Picture Mate printer? Crystal clear, crisp printouts are what the Epson Picture Mate is renowned for. After some time your Epson PictureMate will run low on printer ink, and when it happens you'll quickly see that new Epson PictureMate ink is often quite pricey. Thank goodness you don't need to be concerned about coughing up the steep costs you'll get on the main street because now at Cartridge Save you can purchase all the Epson Picture Mate cartridges you will ever need at very competitive prices. Save a lot of money on your ink by purchasing online at Cartridge Save! Don't think you have to pay so much for the Picture-Mate original cartridge or PictureMate compatible ink on the high street when you could save a load of cash shopping with Cartridge Save. Have total peace of mind when you buy your PictureMate ink cartridges from us seeing as each one is guaranteed by a no quibble money back guarantee. Don't forget to take into account that every purchase comes with free delivery, usually delivered the next business day! Perfect for scrapbook makers and picture lovers, the Epson PictureMate is a portable photo printer. This compact unit can deliver coloured photos with a maximum resolution of 5760 x 1440 dpi. It is very easy to use and its lightweight. There are a few troubles with the Epson PictureMate, mainly, it can only print one size of media 4 x 6 inches, and it cannot run on batteries. This printer comes in grey and it has a handle. The small control panel features function buttons and a monochrome LCD display. For connectivity, a USB port is available plus a PictBridge socket and memory card readers. The Epson Picture Mate colour photo printer only has one foldable input tray. This unit only weighs 5.5 pounds. Wherever users go, they can easily take the lightweight Epson Picture Mate photo printer with them. This printer can work without a computer on as it has a control panel plus memory card readers and a PictBridge socket. Users can expect great quality output from the Epson PictureMate inkjet photo printer. This unit is compatible with Macintosh and Windows computers. Patented Epson PictureMate inks have lightfastness for up to 104 years. 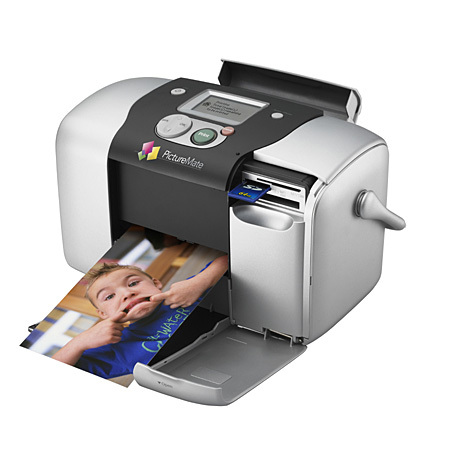 New portable photo printers usually have coloured LCD displays for easy photo printing. The Epson Picture Mate cannot print other media sizes and its portability function is not maximised as it can only work with a power outlet nearby. The Picture Mate printer could be better with the addition of Wi-Fi, but it offers Bluetooth, which must be bought separately.